St. Louis, MO — Exactly two weeks after a medical emergency at the St. Louis Planned Parenthood abortion facility sent a woman to a hospital emergency room, another ambulance was called to the same facility to treat yet another patient. This makes brings the total of documented medical emergencies at Planned Parenthood’s St. Louis abortion business to 62 in under seven years. 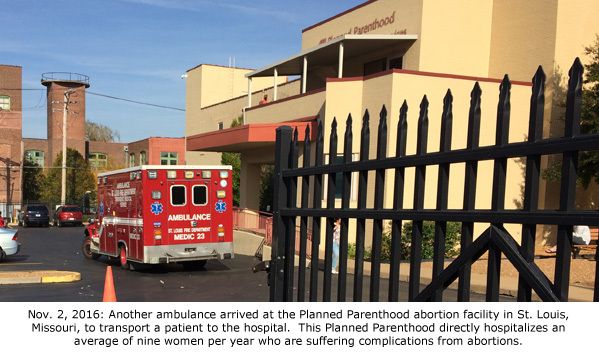 According to Mary Maschmeier, President of Defenders of the Unborn, the ambulance arrived at Planned Parenthood at approximately 2:30 p.m. on November 2, 2016. Emergency responders were inside the facility with the patient for about 20 minutes before walking her out to the ambulance and transporting her away from the clinic. Abortionist Colleen McNicholas settled a medical malpractice case* last July a “minor amount.” That case was brought by a family of a baby that appears to have been injured during a delivery. McNicholas, who is based in St. Louis, travels about the Midwest conducting abortions at a number of facilities. Read about the Oct. 19, 2016, medical emergency at Planned Parenthood in St. Louis. *View court documents at AbortionDocs.org.